Gratitude bestows reverence, allowing us to encounter everyday epiphanies,those transcendent moments of awe that change forever how we experience life and the world. It’s American Thanksgiving today and for the entire month of November I have been surrounded by ‘Gratitude’. People have posted everyday about what they are thankful for on Facebook and Twitter. There was a gratitude challenge at my yoga studio. Just about everyday people offered the ‘intention of gratitude’ as a focus for their yoga practice. So much damn Gratitude. I hated it all. I removed all of the ‘Gratitude challenge statements’ from my timeline, I stopped following people on Twitter, and I never, not even once, made a ‘I’m so grateful for…’ statement, on social media or in real life. Why am I so Ebeneezer about this? Why am I not stating daily how grateful I am for the thousands of blessings in my life? Why am I not all dewy eyed about other people’s Gratitude? 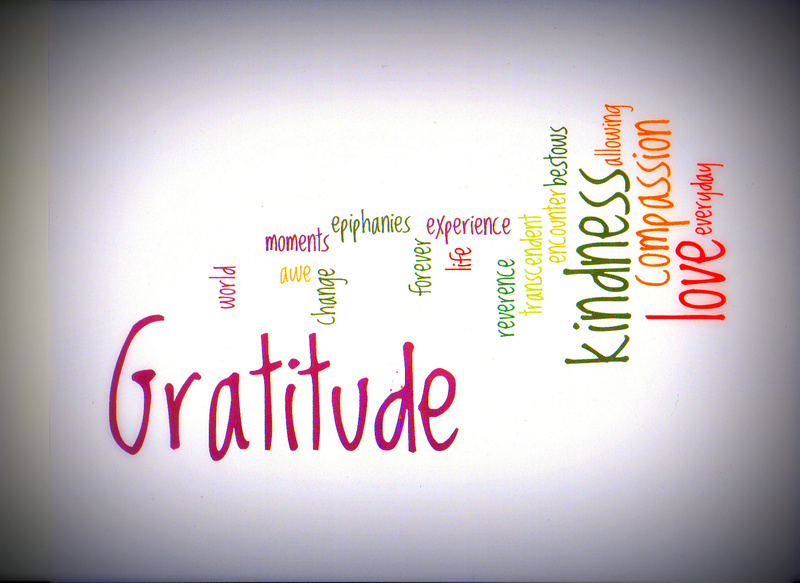 To live your life with constant gratitude is a profoundly spiritual way to live. To be continually humbled by the innumerable blessings in your life, and to share them and to live to help others is one of the best aspirations we can have. To remain grateful in times of sorrow, heartbreak and frustration is the way to live through these difficulties with grace and equanimity. To be grateful for the soap dish, for the window latch, for the pots is to acknowledge you are part of something bigger, so much bigger and grander than yourself. That you are not alone, but part of the greater community, that the world is open to you and that everything is waiting for you. So today. Today, I am grateful. Today, I know I am part of something greater and more fundamental than myself. Today I am grateful to feel that love as the greatest gift that is bestowed upon me and one that I send back out to the world. This entry was posted in thoughts, Uncategorized and tagged Gratitude, kindness, learning, life hacks, love by glasshill. Bookmark the permalink.